Marhaba! If you're new here, you may want to subscribe to my RSS feed. Or follow me on the social network Facebook. 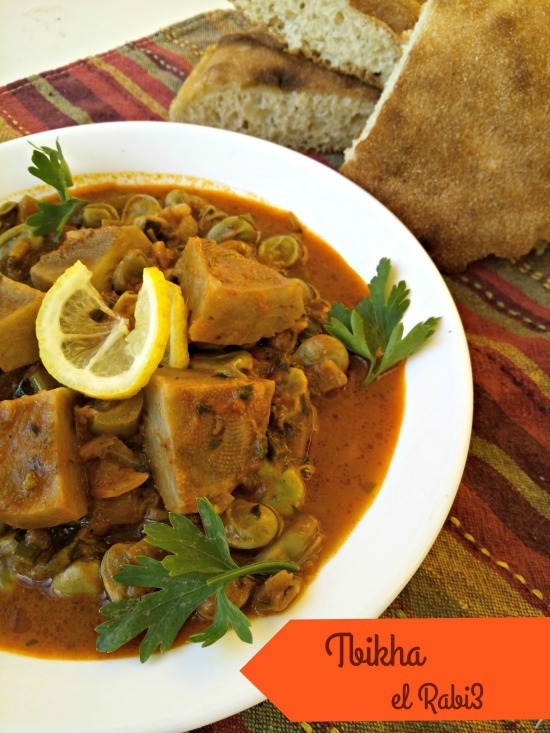 Garantita also written calentita, galentita, karantika, karan, kalentika, grantéta, karantita, garantita, garentéta, gaurantita, kalentica, karentita, or even in Arabic كرنتيكا is an Algerian dish made from chickpea flour. Some call it a tart. Some call it a flan. Some call it a sandwich spread. Whatever you decide to call it, it's just YUM! Garantita is consumed hot and frequently sold by street vendors (and ultra small street cafés) in major cities of Algeria spread on baguettes as a sandwich. 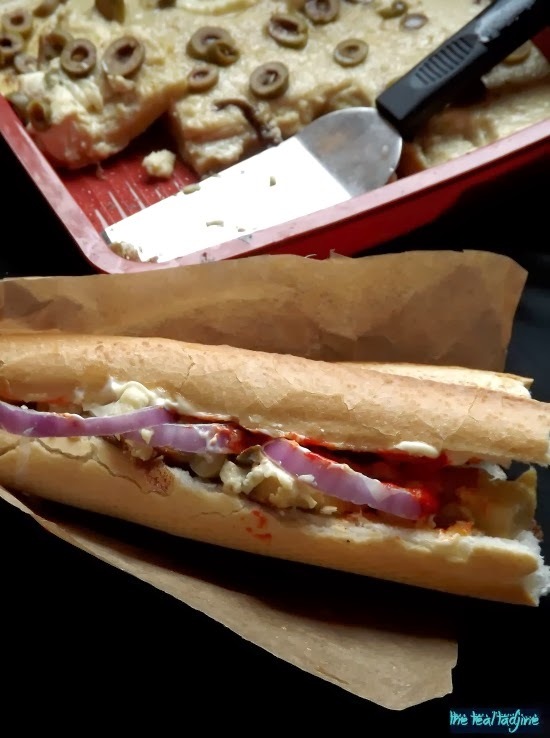 The Garantita smeared inside the bread - usually topped off with harissa, mayo and onions. Optionally, some places offer french fries, cream cheese, tomatoes, olives and even shredded roasted chicken. By vocation, it's a simple and cheap dish that appeals to the wealthy and poor alike. 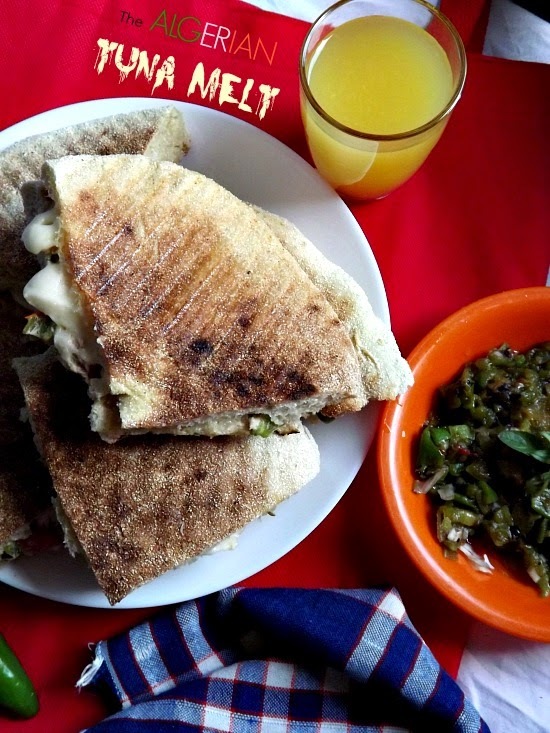 Simply decorated with only harissa and cumin, the "Garantita simple" offers the Algerian customer an inexpensive perfect little pleasure for around a mere 10 dinars (about 9cents € ) for hand held sandwich. 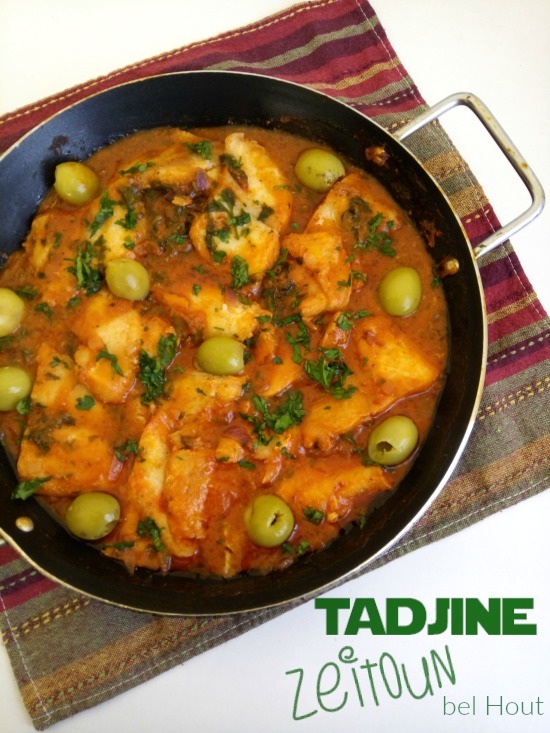 It serves as quick bite for people at lunchtime, but also a tie-over to dinner snack It also serves as a "budget rescue" meal for poor families in Algeria. And behind every popular dish is a story, often of the most unusual and interesting. It is said that a Spanish cook in the 1500s, besieged in the fort of Santa Cruz came up with the dish. Low in morale and supplies he could not console the bellies of the soldiers in his platoon. So he ingeniusly cooked up some chickpeas he had soaked in water, then spread it over simple peasant bread. 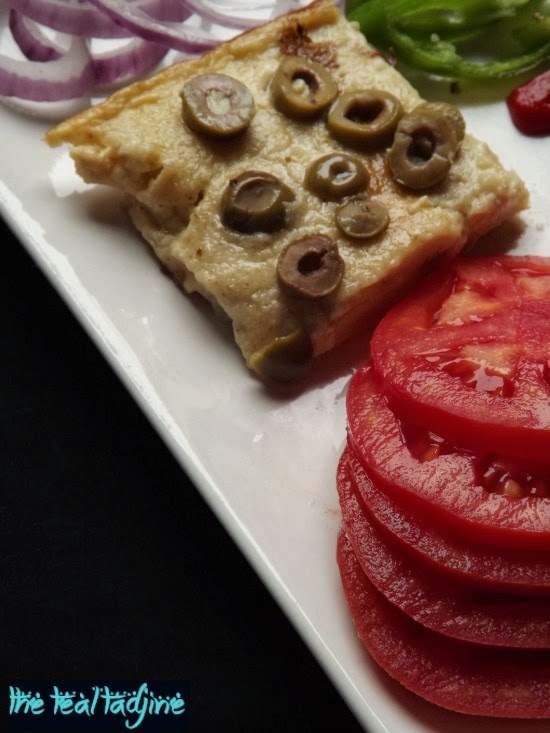 He called it Calentito torta, meaning hot in Spanish, referring to the nurishment the protein packed chickpea offered the troops. The Calentito spread and won eternal glory for this resourceful cook in Algerian culinary tradition. A few centuries later, still in Oran, the Spanish no longer in command in Algeria, the memory of this legend still lives on. 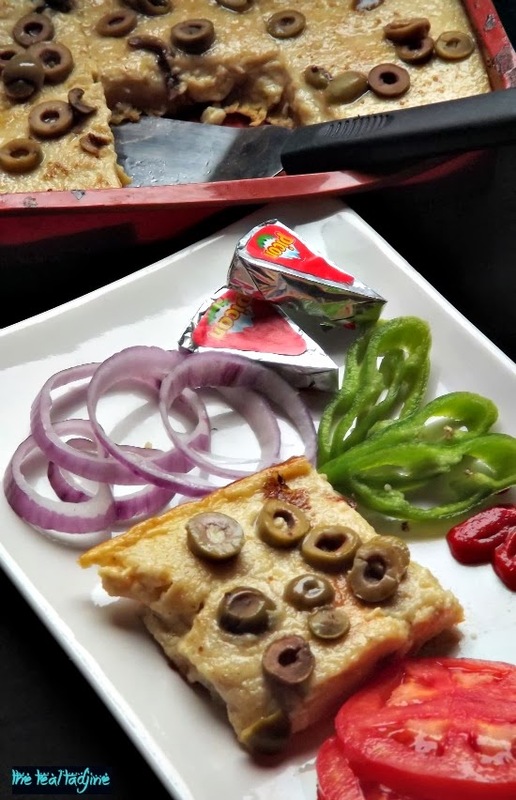 And the legacy of Calentito has entered into the popular food culture in Algeria. And like most Mediterranean dishes, the Garantita has travelled all over the Mediterranean making happy friends. In Italy there's chickpea flatbread called farinata which means ‘made of flour’, in the Genoese dialect it's called fainâ, or in Tuscany it's “cecina” meaning 'made of chickpeas'. 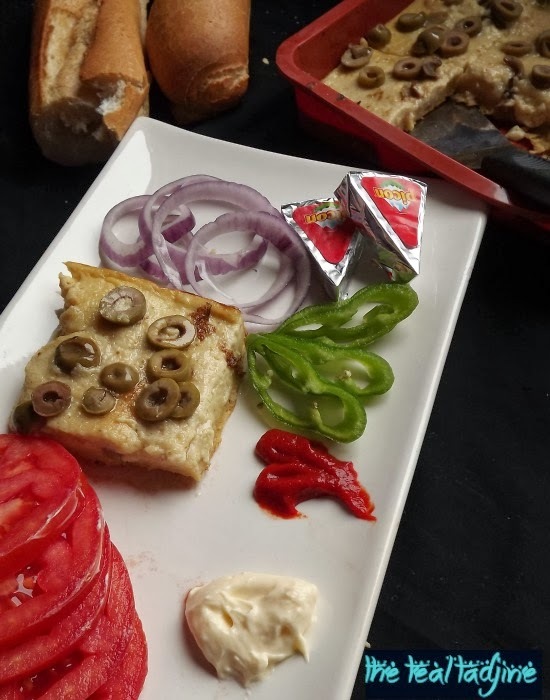 In Provençe, a similar flatbread “socca” but finally in Gibraltar you find the Calentita the kissing cousin of the Garantita where it has reached 'national food' status. 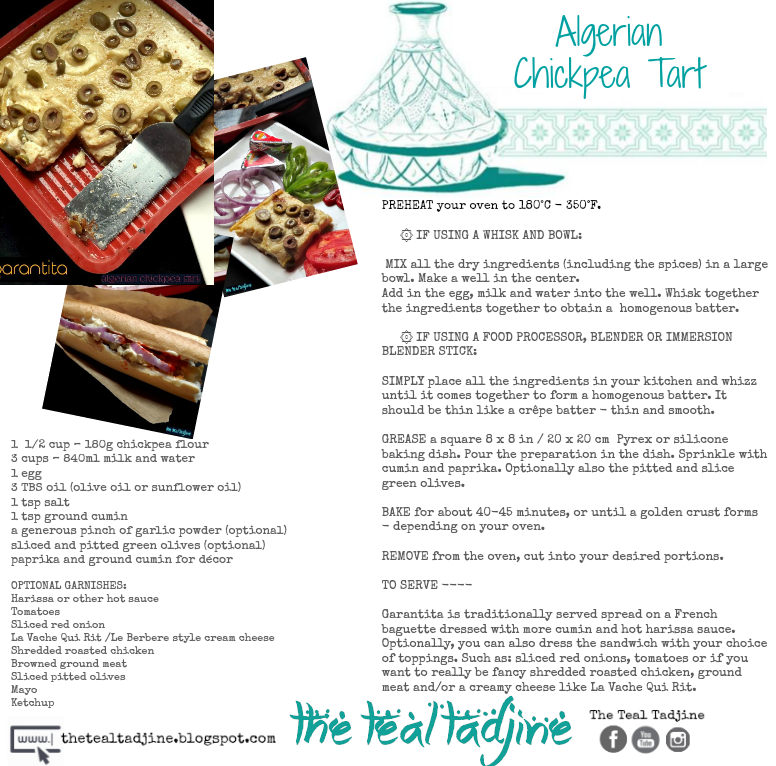 ๑۞๑ Just to note, chickpea flour here in Algeria is called Farina Garantita or also by its French name Farine de pois chiche. You may find elsewhere in the world, it may also be called Besan flour, Gram flour, Chana flour or even Garbanzo Bean flour. It is incredibly high in protein. Excellent for children, vegans, vegetarians and anyone trying to find inexpensive protein sources. It's also naturally gluten free and low in calories. MIX all the dry ingredients (including the spices) in a large bowl. Make a well in the center. Add in the egg, milk and water into the well. Whisk together the ingredients together to obtain a homogenous batter. SIMPLY place all the ingredients in your kitchen and whizz until it comes together to form a homogenous batter. It should be thin like a crêpe batter - thin and smooth. GREASE a square 8 x 8 in / 20 x 20 cm Pyrex or silicone baking dish. Pour the preparation in the dish. Sprinkle with cumin and paprika. 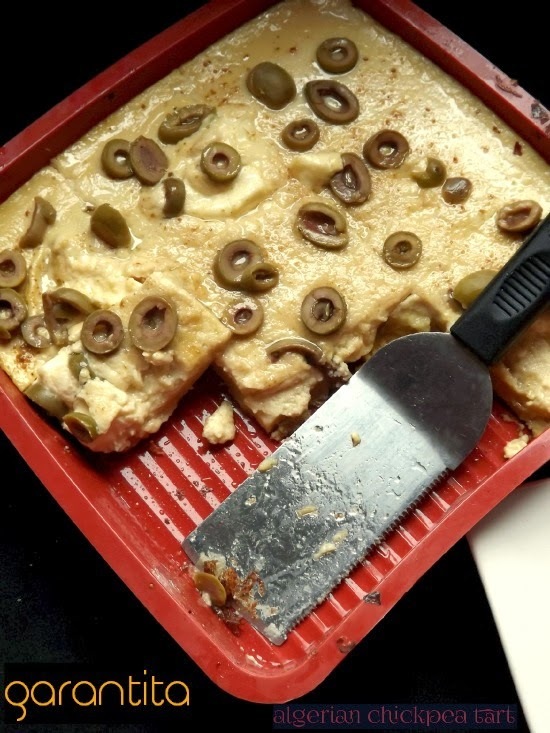 Optionally also the pitted and slice green olives. PLACE under a broiler for about 10 minutes OR BAKE for about 40-45 minutes, or until a golden crust forms - depending on your oven. REMOVE from the oven, cut into your desired portions. Garantita is traditionally served spread on a French baguette dressed with more cumin and hot harissa sauce. 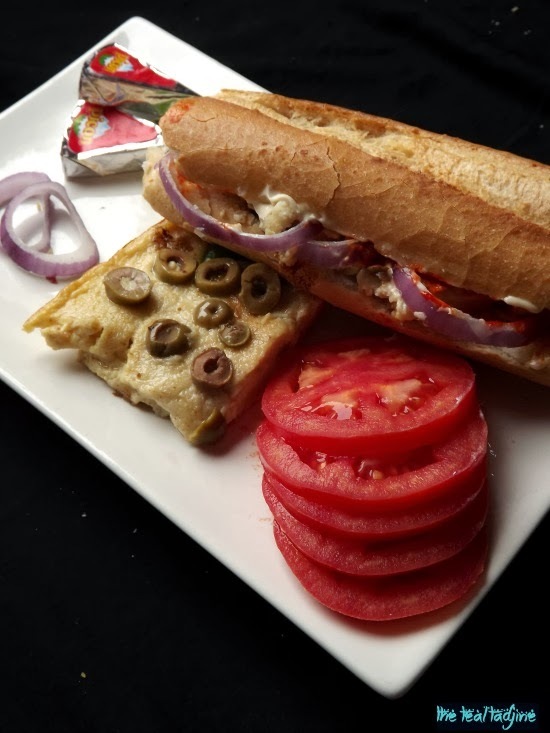 Optionally, you can also dress the sandwich with your favorite sandwich topping, such as sliced red onions, tomatoes or if you want to really be fancy shredded roasted chicken and/or cheese. Chickpea flour is widely available in Turkish, Indian and Middle Eastern shops. It can also be labeled as besan flour, gram flour, cici flour, chana flour, or garbanzo bean flour. Can't find chickpea flour in your area? You can easily make your own by roasting chickpeas in the oven, then after cooling grinding them in a coffee grinder. Can't even find chickpeas even in your area? Yellow lentils prepared in the same manner (as above) is a good substitute in this recipe. Make this recipe by omitting the egg and using one flax egg by mixing 1 tablespoon flax meal + 3 tablespoon hot water. Below is a save-able & sharable Recipe Card. Just click right to save. WHAT'S YOUR go-to quick and easy lunch? I must say I have never heard of this dish - thanks for the history on it! I've often eaten (and made) socca and farinata and they're lovely but this sounds great. The addition of cumin is really appetising. To make socca or farinata, you need to let the mixture rest for a few hours before cooking but garantita sounds much quicker to make. This beautiful tart I have never encountered in the state you have presented. It seems a beautiful 'garniture' and more! . . . Just I would never dream of using a 'la vache qui rit' in any serious recipe! Well, you did say it to be just an example!!! Salaam and hello, Thank you all for commenting. Truly Algerian cookery is underrated and a hidden jem! @Karima Ask your husband about this dish, I'm sure he knows it. And give it a try of course! Thank you both for commenting and stopping by. @Farah Merci Farah pour commenter. Have a beautiful both of you! Wow this looks incredible. Great pics too. Thanks so much for joining in with #recipeoftheweek. I’ve pinned and tweeted this post and there’s a fresh linky live now. I hope you’ll pop over and join in again this week, if you haven’t already! It's Gibraltar not Gibralter and it's not in Spain. Making this again today -- last time it came out delicj and was easy peasy to do! 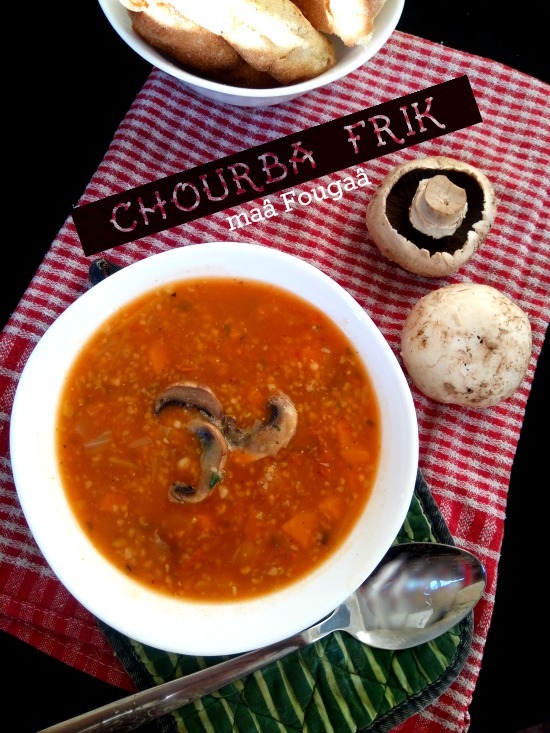 Thank you for all your effort of postingthe recipe and I loved readingabout its history and cultural background!